From the Transition page, you can set the duration of different smooth transitions. The transition is the time when Iris goes between day and night mode for example. The longer the transition the more smooth the colors will change to more orange and red or too bright screen. Some people like instant transition why others prefer the transition to be several hours. From here you can set it to whatever value you like. 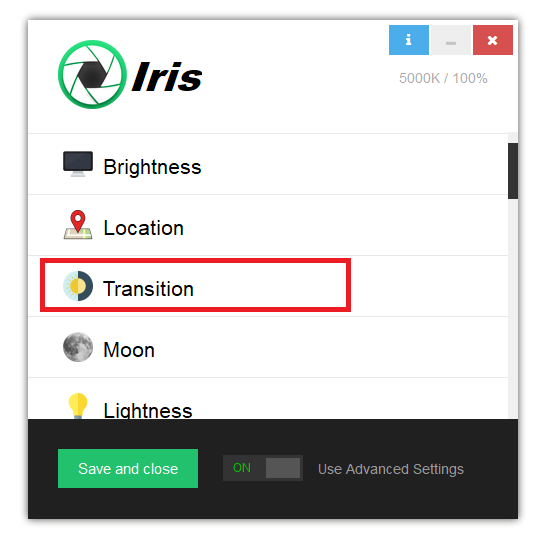 With Day Transition you can set the duration of time when Iris goes from Night to Day mode. This is typically the time early in the morning. You can check when is the Day transition start and end time form the Transition times infobox. 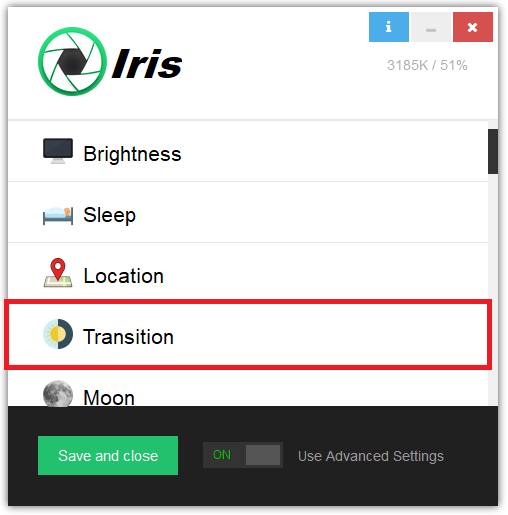 With Night Transition you can set the duration of time when Iris goes from Day to Night mode. This is typically the time when the sun is down. You can check when the Night transition start is an end time form the Transition times infobox. With Sleep Transition you can set the duration of time when Iris goes Sleep mode. This is the time which is set from the Sleep page. 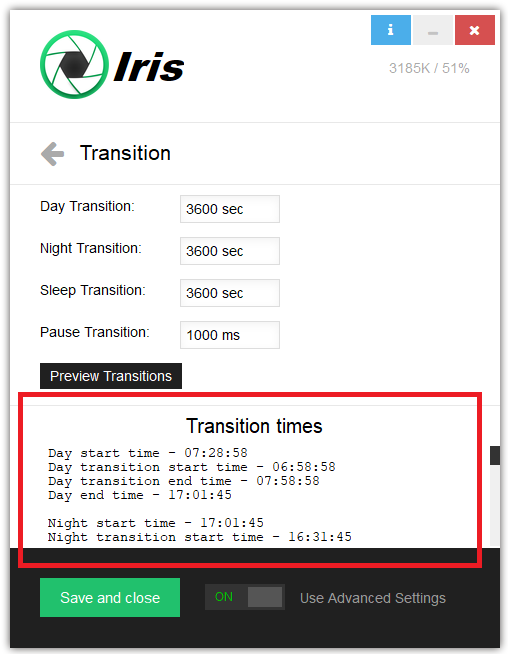 You can check when is the Bedtime transition start and end time form the Transition times infobox. With Pause Transition, you can customize the time in which Iris goes from Pause to Resume. This is both when you manually pause and resume Iris or when Color pausers are used. With the Preview Transitions button, you can preview the transition that you’ve set and how they will look like. Transition times infobox shows you all info about when a day, night, bedtime, waketime starts and ends. It shows you sunset, sunrise and all information Iris uses to automatically adjust during the different time of the day.